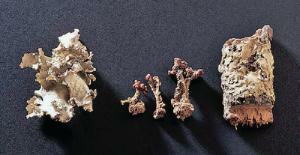 These dry specimens are handy for showing the variance of lichen growth habits. Contents: Crustose Lichen, Fruticose Lichen, and Foliose Lichen. Supplied in separate, labeled jars. Set of three.